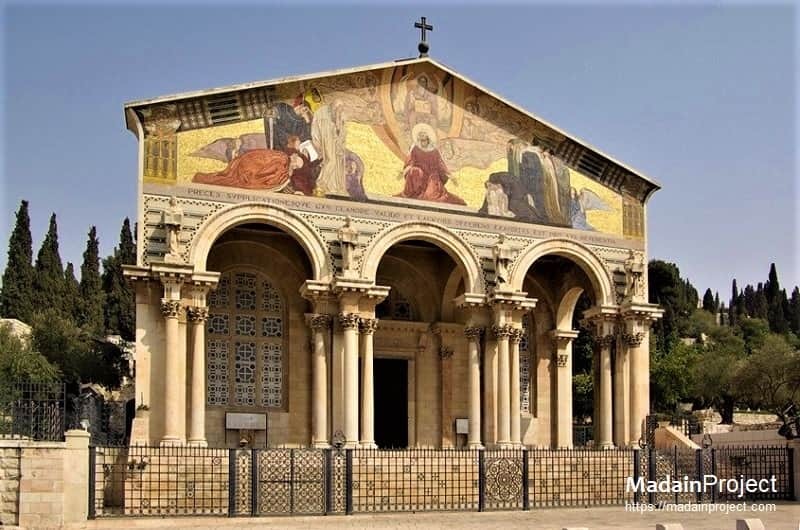 The Church of All Nations, also known as the Church or Basilica of the Agony, is a Roman Catholic church located on the Mount of Olives in Jerusalem, next to the Garden of Gethsemane. It enshrines a section of bedrock where according to biblical tradition Jesus is said to have prayed before his arrest. Facade of the Church supported by a row of Corinthian columns with evangalists' statues atop each column. The columns and statues are set below a modern mosaic depicting Jesus Christ as mediator between God and man, designed by Giulio Bargellini. On the summit of the façade stand two stags on either side of a cross. The bedrock (rock of agony) where Jesus is believed to have prayed, before the main alter in the central hall. The crown around the bedrock itself was a gift of Australia, depicting the crown of thorns placed on Jesus' head by Romans. The mosaic behind the main alter (pictured above) depicting Jesus leaning on the rock of agony during his last night before his capture by the Roman soldiers. Above the rock an angel decends and three of the deciples can be seen to the right sleeping beside an olive tree. The mosaic to the right of the main alter and the central mosaic, where Judas is depicted kissing Jesus referring to the episode of his betrayal with Jesus resulting in his arrest by the Romans. Alabaster panels dyed violet were used for the windows to evoke a mood of depression analogous to Christ's agony, and the ceiling is painted a deep blue to simulate a night sky. The fragments of an ancient (probably 4th century Byzantine basilica) were found and preserverd. The interior of the Church is divided by six columns into three aisles, but with an even ceiling lacking a clerestory. This design gives the impression of one large open hall.